The tech giant wants to tap into the keyboard app company's AI expertise. At a time where more and more start-ups are being labelled 'unicorns', a $250m (£173.2m) offer may seem like small beer. 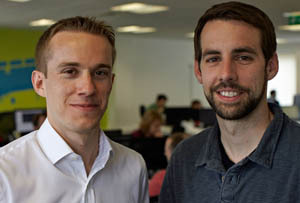 MT can’t help thinking SwiftKey founders Jon Reynolds and Ben Medlock aren't going to feel too hard done by though. That’s the princely sum Microsoft has coughed up to buy the UK keyboard app company, which in itself may seem slightly eyebrow-raising. $250m for keyboard apps? Not just any old keyboard apps though – SwiftKey has been utilising AI in a rather nifty way. Its technology suggests the next word a user is about to type by analysing their writing style. The company claims its keyboard can learn slang, nicknames and a user’s preference on emojis too. It’s a popular keyboard app on both iOS and Android and Microsoft is planning to integrate SwiftKey alongside its own Word Flow keyboard for Windows too. The golden egg appeal for Microsoft is that it's picking up some shiny talent to bolster its research team and tapping into SwiftKey's AI know-how. Harry Shum, head of Microsoft Research, said, ‘We love SwiftKey’s technology and we love the team that Jon and Ben have formed.’ The AI work was evident in SwiftKey's latest Android keyboard, which uses a neural network (a computer system modelled on the human brain and nervous system), rather than standard algorithms when predicting words. The move isn’t that surprising. Microsoft has been delving more into intelligent assistance with virtual personal assistant Cortana and this latest move follows acquisitions of calendar app Sunrise and email app Acompli – reflecting its focus on providing software and services on iOS and Android. It also ties in nicely with Microsoft’s chief exec Satya Nadella's cloud crusade. SwiftKey syncs its learnings from each user in the cloud, so it gets smarter as you use the service on more platforms.